Dermaplaning is a method of exfoliation that consists of using a 10 gauge scalpel to gently scrape off the top layer of dulling dead skin cells in order to reveal a smoother, brighter complexion. Sounds scary, right? It really isn’t, as long as you’re in the right hands. It also eliminates that annoying peach fuzz.“Dermaplaning removes all the dead skin cells and also the facial hair, leaving the surface very smooth it also allows for greater penetration of skincare products and creates a flawless canvas for makeup to glide on smoothly. 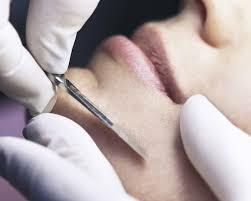 Dermaplaning is a favorite in the entertainment industry, specifically among models and actresses. Why? It also eliminates that annoying peach fuzz that cakes up in makeup and can be enhanced by harsh production lighting and high-definition cameras. Wondering if you should try dermaplaning versus microdermabrasion? They are both forms of physical exfoliation, but the methods are very different. Microdermabrasion sands and suctions dead skin cells, which also helps to uproot clogged pores around the nose, mouth and chin. Dermaplaning safely scrapes off the top layer of skin, so it is well suited for drier skin types and anyone who wants to get rid of peach fuzz. But, keep in mind, both methods are good for almost everyone and it could just boil down to your personal preference. 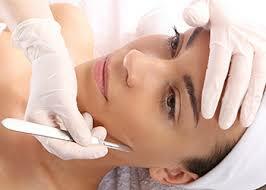 Dermaplaning is recommended for all skin types except those with acneic skin. If you have deep cystic acne, wait until breakouts are clear before trying this treatment. As always, also discuss any allergies or skin sensitivities before starting a treatment. This is a great treatment if you are pregnant or nursing and want exfoliation without the risk of harsh chemicals absorbing into the blood stream and potentially harming your baby. Dermaplaning is a painless procedure and can be compared to the sensation of shaving your legs, but in this case, it’s on your face. First, the aesthetician will cleanse and thoroughly dry your skin. Next, she’ll pull an area of your skin taut with one hand, and hold a sterile 10 gauge blade at a 45 degree angle in the other hand and use short, swift strokes to scrape off dead skin cells and peach fuzz. There are no side effects and zero downtime. After the treatment, your skin will be highly sensitive to sun exposure and may already look very pink, so be sure to wear a broad-spectrum sunscreen with SPF 30 or higher to reduce the risk of hyperpigmentation. If you have resilient skin, try coupling microdermabrasion and dermaplaning in the same session for incredible results. Many women are often concerned that shaving peach fuzz will make it grow back heavier and darker, but that’s just an old wives’ tale. Superficial vellus hair (that’s the science-y name for clear or white soft fine facial hair) will grow back at the same rate and with the same texture as it was before the treatment. ​Dermaplaning removes 21 days worth of dead skin cells, so it’s best to allow the skin to complete its rejuvenation cycle before your next treatment.